There is no limit to what you can do with your Customer Retention Program. Below are just a few examples. Remember, our Loyalty programs can be completely customizes to your stores needs. Many dealers give away their new customers first oil change for free to get them in the habit of coming back to their store. Why not put this offer right on your customers’ key chain at time of delivery? Once they come back they are then automatically a part of your loyalty program with incentives for future services. Incentivize your customers with dollars off each visit. 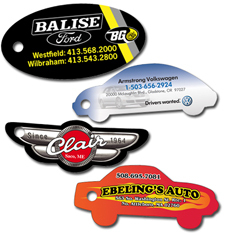 Key Tags are fully customized so discounts for each visit are up to you. i.e. Progressive discounts – higher dollar amount off for each progressive visit or equal amount off each time they come in. 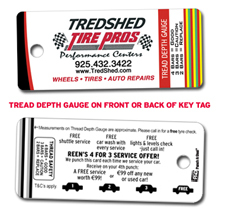 With tire sales becoming more and more important in helping with customer retention, why not give your customers a tire depth gauge to keep on their key chain? With this gauge, your customers can check the tread depth of their own tires and have your phone number and offers right at their finger tips when they need their next set of tires. Many businesses sell pre-paid maintenance packages. 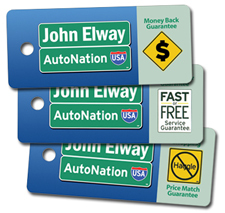 Why not use the Punch-A-Deal® Key Tag to identify each customer that has purchased a prepaid package. Unlike a coupon or check book, the Key Tag is with the customer 24/7 and they can never claim to have left it at home. Besides identification, these customers will also have other valuable offers and important information on their key chain – i.e. Roadside assistance number, additional discounts, and direct phone number. We can bar code or individually number any Punch-A-Deal® product for you. This way you can provide a unique identifier to tie the consumer back to your DMS system. We offer everything from a complete gift card program which tracks dollar amounts stored on each card to a simple one-time use gift card program, which requires no additional hardware or software. Why not let your customers become your best source of leads by letting them know about your referral program where they can earn dollars for referring a customer to your business? Again, Key Tags are fully customized so that you choose the number of visits a customer must make before they get something for free. Our most popular offer is buy 4 get the 5th FREE. Each day hundreds of prospects visit your business. Why not hand them something (other than a business card) that sets your store apart from the rest and invites them to come back in the future? 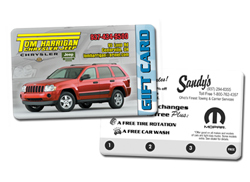 Use the Punch-A-Deal® Key Tag to sell all the benefits of doing business with your store. Remember, these prospects all need service and eventually will be in the market to buy. Give them reasons and a reminder to come to you. Each time you visit your dentist, they hand you a reminder card with a date and time of your next appointment. Why not do the same with your service customers? 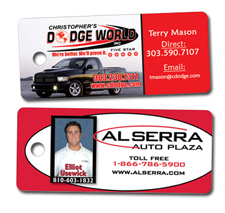 Our most popular tags are the small and large rectangular tags. Keep in mind that we can have your Punch-A-Deal® made in any size or shape imaginable. Punch-A-Deal® can be personalized by department, manufacturer, promotion, or individual employees. Imagine how your business would stand out. The customer would never forget who their service writer or sales person is. For example, a 10,000 – piece order could be divided up (separate designs) between two franchises. i.e. Toyota tag and Chevrolet tag. Example, a 5,000 piece order could all have the same design with different employee names or photos on groups of 500 tags at a time. You would take advantage of higher quantity pricing and pay a small art charge for each copy change. If you are looking for a way to increase your business, reward your customer and give back to the community, you are going to want a Charity Punch-A-Deal®. Since each order is custom designed from scratch, we can help work with a charity or community program of your choice. Besides the typical co-op programs from your oil company or parts and service program, why not partner up with another local non-competitive business? One side of the Key Tag for you, the other side reserved for them. You just cut your program cost in half and still get the same fantastic results. Are there additional services you want your customers and prospects to know about? If so, make sure you promote them on your tag. They could be something as simple as discounts on parts and accessories to a free courtesy shuttle. Make sure your customers know what differentiates you from everyone else. Chances are every customer who buys or services their car with you has a spouse or significant other. Why not invite them back to your place for service? 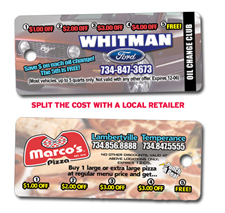 Hand out an additional Punch-A-Deal® Key Tag for each delivery or service visit. We all know how important it is to get the customer in for service at regularly scheduled maintenance intervals. Why not put these intervals on the customer’s key chain as a reminder. 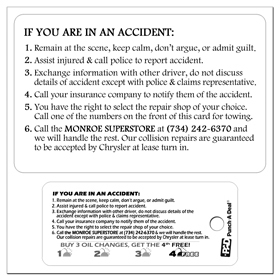 Provide your customers easy access to important information in case they get into an accident. The Punch-A-Deal® is not just for oil changes anymore. Why not encourage your customers to come back in for tire rotations or other related services. Offer your customers a reward for hitting certain dollar amounts or making certain purchases throughout the year. i.e. For every $100 spent, you earn a $10 credit.